The influx of women in the workplace starting in the 1960s was partly attributable to the development of infant formula. Formula gave mothers of newborns added freedom to return to work after childbirth. However, in the last few decades, research findings overwhelmingly in favor of breast milk over formula have instigated a marked increase in the number of mothers choosing to nurse their children for the first year of life or longer. The dramatic health benefits for infant and mother have influenced these mothers to dedicate long hours to pumping and storing breast milk when they are not with their babies. Several times a day, a nursing mother needs a quiet, enclosed room to collect expressed milk. She needs a calm restful environment for an efficient and safe pumping session. A typical pumping session includes changing clothes, sitting at a work surface in front of a pump for 15 to 30 minutes, placing milk in storage bottles, washing bottles and pump parts, packing them away until the next pumping session, redressing, and returning to work. At the end of the session, the pumped milk must be stored in a refrigerator or cooler. In an eight-hour work day two or three pumping sessions are normal. Mothers face challenges to express medically beneficial breastmilk while reentering the workforce. Companies that provide lactation rooms in the workplace help these employees achieve both of these goals. Public facilities increasingly provide rooms for lactation and nursing due to growing demand. 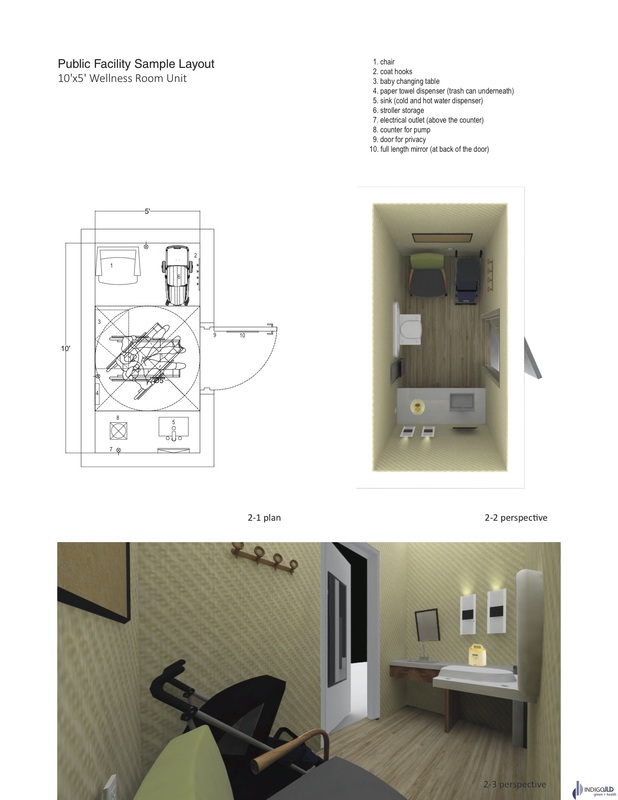 The design guidelines given here will yield a room layout that is easy to use and offers comfort and respect to mothers, while also serving other wellness purposes. Minimum of one Wellness room per building. With more than 100 women (or 200 employees, both male and female), at least one additional room or space is recommended. Should be proximate to other wellness amenities and bathroom facilities. Should be located in a safe area accessible to all. Should not be located in areas that would not be suitable for food preparation and storage. A minimum footprint of 7 feet by 7 feet is recommended, allowing for a 5-foot radius circle with a 24-inch deep counter. Other configurations such as 10 feet by 5 feet work well in offices and public facing facilities where more mothers are likely to be breastfeeding their babies. Install a user-operated lock with an indicator for privacy. Best locks include an indicator that displays an “occupied” message to discourage interruptions and still allow one hand operation for exiting the room in the case of emergency. Walls should ideally reach up to the structure or install sound attenuation in walls to minimize echoes and sound transmission (i.e. minimum STC 45) over them into adjacent spaces. Carpeting or other sound-dampening materials to minimize echoes. Provide a task chair suitable for a workstation with adjustable seat, back, armrest, lumbar, tension, and height. A more comfortable chair could also be placed in the room if mothers frequently use the room to breastfeed their babies. Casters to allow the user freedom of movement when hands are occupied with bottles of milk and pump parts. Specify fabric or material designed for easy cleaning or wiping. Provide a minimum 18-inch deep by 32-inch wide laminate or solid work surface that is easily cleanable. Desk height with electrical outlets above the work surface for pump, accessories, and bottles to rest on. Provide clear knee space beneath the counter. Provide a sink and faucet combination deep enough to wash bottles and pump parts. Goose neck or kitchen type faucets are recommended. If possible, locate the sink adjacent to the work area and provide towel dispenser nearby. Uniform ambient light for a restful and soothing environment. Task lighting should be provided over the sink and the pump area. Room temperature should be maintained year-round at a comfortably warm level such as in a dressing room. A thermostat in the room could increase user control and thermal comfort. Install a midsize or compact refrigerator for milk storage. Under-counter models help conserve floor space but should not take up the knee space beneath the work area. Refrigerators are not needed in public facing facilities where use is more transient. Rooms that are sized to accommodate more than one user may require a mid-sized or a large refrigerator, depending on frequency of use. Useful accessories in a Wellness room include a trash can, a paper towel dispenser, a coat rack or coat hooks, and a full-length mirror. Educational information for nursing mothers can be put on a bulletin board. Storage space for pumping supplies is recommended in office environments where users visit the room on a regular basis. Accessories should add to a calming environment and soothing wall color palette. If many mothers will be sharing the room, installing a scheduling system or communication board outside the door could facilitate efficient use of the room. Large government entities and corporations lead in creating these spaces. Many factors come into play, such as company culture, changing demographics, and human resources support. Public access facilities will require even more forethought as there are many dynamic factors in addition to market conditions and operator requirements. The road is widening for designers and green building professionals. – Dr. Jennifer A. Pinto-Martin, Executive Director, Center for Public Health Initiatives, University of Pennsylvania School of Nursing and Perelman School of Medicine. Joyce Lee, FAIA, LEED Fellow, is President of IndigoJLD, an organization that provides green health, design, and planning services on leading edge green projects. She has been an Architect Fellow at the National Leadership Academy for Public Health and one of the first LEED accredited professionals in New York City. She also serves as senior communications advisor for the 2030 Districts Network. If you have a well-designed Wellness room photo to share, please send to info@IndigoJLD.com. The content in this article is developed from the American Institute of Architects (AIA) Best Practice update by Liz York, FAIA, and Joyce Lee, FAIA. They would like to thank the Advisory Committee: Jane Kaufman, University of Pennsylvania School of Nursing; Amy Spangler, baby gooroo; Amanda Higgins, General Services Administration; Mara Baum, HOK; Melissa Walker, Hilton Hotels; Kristen Suzda,Wallace, Roberts & Todd. 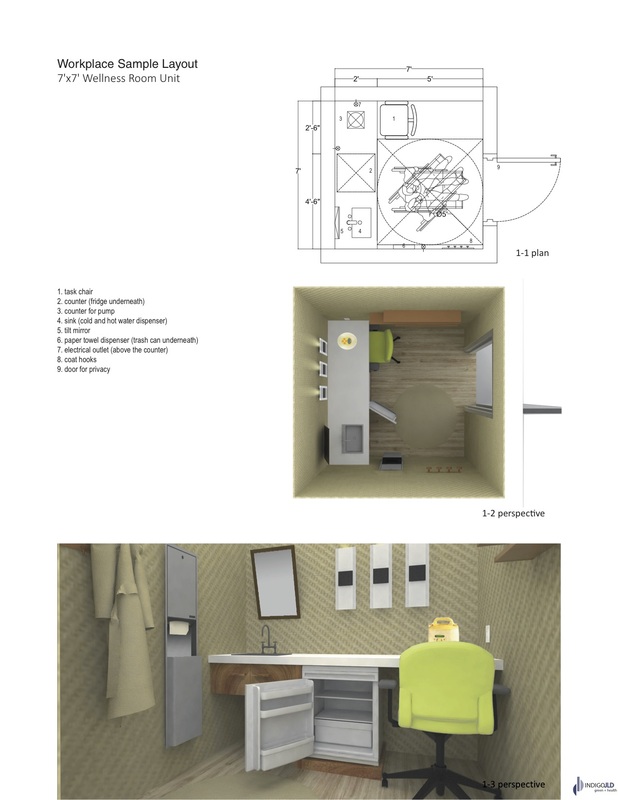 Design assistance provided by Yubei Huang and Tong Niu from PennDesign at the University of Pennsylvania.